Don't pass up the amazing opportunity to see the world in a stunning vessel such as this Globetrotter travel trailer! 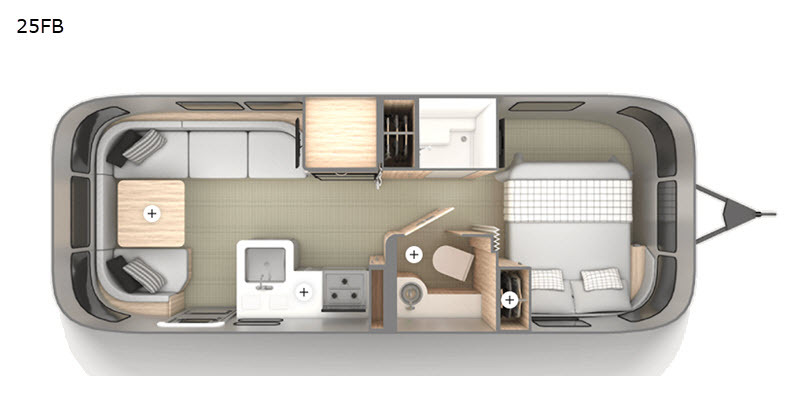 You will enjoy how stylish the interior feels with its queen-size bed, decorative throw pillows, LED reading lights, and under-the-bed storage in the front private bedroom, and having a separated bath will be wonderfully handy for you and your guests as you prepare yourselves for the day ahead. Even the kitchen will brighten your travels with its Baraldi cooking vent, flatware organizer, stainless steel sink, and three-burner stove top. 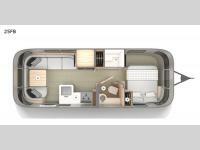 In any Airstream Globetrotter travel trailer you will find a contemporary, European-inspired design done right with clean lines and elegant features that create the perfect traveling home. Panoramic windows along with premium high-end kitchen appliances, extensive storage, and spa-like bathroom comforts create an atmosphere that you won't ever want to leave. The Globetrotter is loaded with all of the entertainment and technology features that you've grown to love, such as Samsung LED HDTVs, USB charging ports, a Blu-Ray DVD player, power jacks, and more. With the reflective curves of the classic Airstream aluminum body shell, you will be sure to draw attention when you take the Globetrotter out on your next wander lust excursion.